Character » Darth Malak appears in 37 issues. Darth Malak was a Dark Lord of the Sith and the former apprentice to Darth Revan. Before his fall to the dark side, Malak was a valiant Jedi Knight who fought in the Mandalorian Wars. This is the largest collection of Darth Malak feats and accolades. Respect the Sith Magnus. NOTE: For optimal experience, view this respect thread in its blog format. Additionally, please do not view this thread on a mobile or tablet device - use a laptop or personal computer. May the Force be with you. Darth Malak was far more powerful than Exar Kun or Freedon Nadd. If you are skeptical about this quote, click here and here for confirmation that the quote means what it says and is Lucas Licensing approved. "An imposing figure with ghostly pale features, prominent Sith tattoos, a gleaming red lightsaber, and devastating Dark Side power, Malak struck terror into the hearts of his former allies. He also wore a vocal mask that may have concealed a form of cybernetic life-support. Did it provide him with powers far greater than even Exar Kun or Freedon Nadd, or was cybernetic enhancement too simple an explanation?" According to the Exiles, which includes Karness Muur and Ajunta Pall, the source of their power was the Star Map - a Sith artifact immeasurably less potent than the Star Forge. Thus, it logically follows that, with the Star Forge, Darth Malak is far greater than them, especially because the Exiles were weary over the power of the Star Map whereas Darth Malak mastered the Star Forge to levels never seen before. "We were not the first to fall to the dark side. But we had more power than those before us. It came from elsewhere - our oldest secret. Only we would know, we lords. Only we would know where our power came from. It is a secret of so long ago. I no longer remember. So much power, it is blinding. You must find this place, or have you? Or did you? Or will you? Oh, so many images. I see your heart, human Jedi. I see your power, your pride. You, you will find the old place, the dark place, and you will regret it." After being redeemed, Bastila Shan feared that, if she were to join Revan in his confrontation with Darth Malak, the Sith's presence would overwhelm and corrupt her back to the dark-side. This description is similiar to statements made about the Sith Emperor Vitiate, who likewise had such power. "I should stay here, though. If we face Malak, I am afraid his dark presence will overwhelm me. It would not be wise to expose myself to such temptation." Darth Malak was noted to be nearly unstoppable when in possession of Jedi captives. "The Sith Lord had grotesquely adapted the Rakatan device to draw energy directly from chained Jedi captives. He replenished his life force from the captives by draining theirs. Malak was nearly unstoppable, but the Republic emerged from that epic conflict victorious, as the Star Forge was eventually destroyed." The Elder Council suggests that only Revan could defeat Darth Malak in battle. "You must go now, Revan. The Star Forge feeds the power of your old apprentice. If you do not stop him soon he will become too powerful for even you to stop." Darth Malak was one of the most powerful Sith Lords in galactic history. "Many of the most powerful, terrifying, and notorious Sith Lords through history have been Human or near-Human, including Exar Kun, Darth Malak, Darth Bane, Darth Sidious, Darth Vader, and Darth Krayt." Darth Malak was so powerful that his thoughts radiated out disturbances in the Force when directed at his victims, and his dark-side presence could be felt thousands of light-years away as it approached. "Did you feel that? A disturbance in the Force. The Admiral has sent is message, the Dark Lord knows we are here now. Malak is coming... We better get moving. I can feel the darkness of Malak's presence approaching, and I don't want to be here when he arrives. None of us is a match for the Sith Lord." According to Vandar Tokare, Darth Malak had embraced the dark side as fully as Darth Revan did and mused he would soon surpass Darth Revan. Whether he did or not is unknown. "When Revan fell we had hoped the Sith threat was ended. But Malak quickly assumed Revan's role, and has embraced the dark side power as fully as his old master ever did. Now Malak leads the Sith armada against the Republic. Hate and vengeance for his master's death draw Malak ever further down the path of the dark side, fueling his powers until they surpass those of his old master." Darth Malak was the most powerful of all the thousands of Sith in the galaxy. "You know the name? Malak is the strongest of us, and the strongest always rules." While Exar Kun was known as the "Dark Lord of the Sith" and Revan was known as the "Prodigal Knight", Darth Malak was known as the "Sith Magnus," meaning "All-Powerful," "Lord of Lords," or "Emperor." "The specific callback I was making, though, was to my own work in the Knights of the Old Republic Campaign Guide, specifically the Darth Malak biography. In the Sith chapter I wrote, I gave all the characters different descriptive titles in their respective subheadings, such as "Dark Lord of the Sith" for Exar Kun, "Shadow Hand" for Darth Bandon, and "Prodigal Knight" for Darth Revan. For Darth Malak, that title was "Sith Magnus." Duron Qel-Droma, a descendant of the infamous Ulic Qel-Droma and one of the most powerful Jedi of his age, was in awe over the power of Darth Malak, as he saw in a vision. He also saw the devastation of Taris. "Another vision... worse this time... worlds dying... Sith so powerful... I... I'm scared." "The ruling Dark Lord of the Sith is a master of the Dark Side of the Force." "With legions of armored troopers spreading throughout the galaxy, all led by masters of the Force, the Sith Empire seems unstoppable." 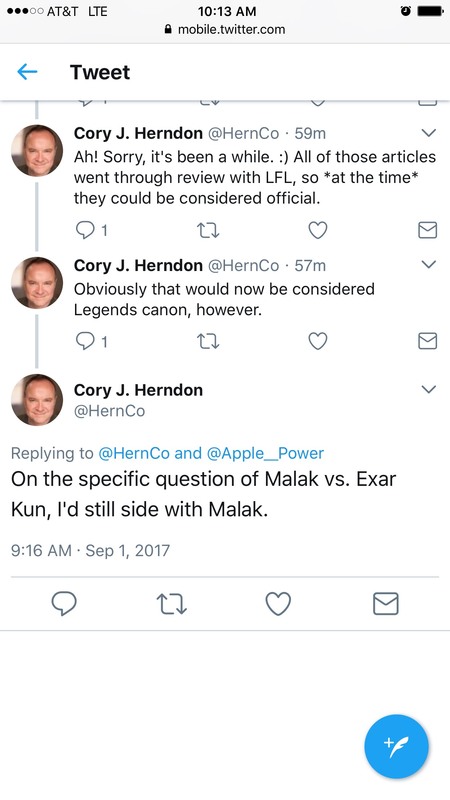 According to Drew Karpyshyn, Darth Malak was a superior duelist to Revan. However, this statement, like others Drew Karpyshyn has stated, seems inconsistent with canonical material presented within the lore. "For me, Malak was always the 'brawn' to Revan's 'brain' - he was renowned for his combat abilities, and I always felt that he was even better than Revan with a lightsaber. I also felt that he wasn't as strong at using the Force in other ways as Revan was." Darth Malak, far before his prime, was able to press Darth Revan into desperation before being defeated. "Malak's most distinguishing feature, his steel jaw, disguises a vicious lightsaber wound inflicted by his former Master in their desperate final battle." While amplified by the Star Forge, Darth Malak gave Revan a brutal battle before ultimately succumbing. "...that [Star Forge] battle would have been a brutal, hard fought affair spread over multiple pages." "Revan then confronted Darth Malak himself in a fierce duel, but Revan prevailed and finally defeated Darth Malak." "It is a period of uncertainty across the galaxy. After a long and vicious battle in the deepest area of the Star Forge, Dark Lord of the Sith Darth Revan succeeds in destroying his ex-apprentice Darth Malak. After recovering from the duel, Revan seeks out the secret dark outposts... "
Darth Malak casually defeated and incapacitated Revan as of his capture on the Leviathan, who was still the most powerful Jedi in the galaxy with impressive combat showings, such as destroying armies of Sith on Manaan. Darth Malak would even have been capable of easily defeating the combined force of Revan, Bastila Shan, and Carth Onasi, according to both the group and Darth Malak. "But not even the three of you together can stand against my power!" "The power of the Dark Lord is strong enough to destroy any of us... even you. It would be suicide to face Malak here." "We ran into Malak. He would have killed us, but Bastila sacrificed herself so we could get away." "Malak will destroy you, but if you throw down your weapons now, I will ask my Master to be merciful." Darth Malak defeated Bastila Shan, a very powerful Jedi Knight, in a matter of seconds. The game's mission logs show us that she was captured by Darth Malak by the time Revanand Carth Onasi stopped planning their escape, which was under twenty seconds. They fought for a mere six seconds before that. "Bastila Shan is the quintessential Jedi: trained from a very young age and gifted with a natural ability with the Force that has given her both renown and considerable pride. "Bastila doesn't stand a chance against Malak." "No Bastila, he is too strong! NO!" Malak was one of the most skilled and powerful warriors in the Jedi Order during the "prime of the Jedi," the Mandalorian Wars, being renowned even as a young man for his prowess with a lightsaber in battle. "Foremost among the heroes of this era were the Jedi warriors Malak and Revan... Though only a young man, his skill in battle and prowess with the lightsaber had already earned him renown within the Order. Given his abilities, and his arrogance, it was only natural that he should ignore the warnings of his Master and join the Republic fleet in its battle against the Mandalorian raiders on the Outer Rim." "Four millennia before the man called Palpatine became Emperor, Malak shone brightly as one of the greatest Jedi heroes. " "Malak gained a reputation as a headstrong warrior who would recklessly charge into danger. Malak's former Masters were well aware of this impetuousness during his days at the training academy on Dantooine." Malak's combat abilities were compared to Revan's military genius in terms of effectiveness. Revan was regarded by many as one of the greatest military leaders in history due to his achievements in war. "In the Mandalorian wars, both Malak and his close friend Revan found the glory they were seeking. While many credited the Revanchist's military strategies for the campaign success, others were quick to point to Alex's fierce courage and relentless fury on the forefront of every battle as the key part to Republic victory." "Revan was one of the greatest military leaders in the galaxy - in history. He knew what he was doing." Malak outdueled Jarael, an exceptional melee combatant praised by the Mandalorians. "Worse, Squint has come along. Squint — it does not appear to be his real name — is a much stronger Jedi than Zayne. I have actually managed to use him to my ends as a sparring partner for Edessa, that I might see her abilities in full. She is a remarkable warrior in her own right, just as I would have expected. Continued exposure to Squint and Zayne could well bring her potential Jedi skills into flower." Malak and some other Jedi cut a swath through a huge number of Mandalorians and HK-24 droids. Malak moved his lightsaber in blurs as he blocked the torrents of blaster fire against Demagol. He then went on to physically disarm the Mandalorian with his bare hands before choking him in a pit of fire. "What followed was nearly a calamity. Malak unleashed his fury - unrestrained." Darth Malak can casually block a flurry of blaster fire from Carth Onasi with ease. Darth Malak was supposedly a practitioner of a one-handed variation of Juyo according to a source that personally emailed him. This means Darth Malak may have been a master of multiple lightsaber forms. "Only high-level masters of multiple forms can achieve and control the ultimate discipline known as Form VII." "Malak was more of a specialist..."
Darth Malak was skilled in combat with an alchemically enhanced Sith Sword. "Once they reach Malak, he may face them with his own lightsaber or, if he feels the occasion calls for it, an ancient Sith sword recovered from ruins on Korriban." "[Darth Malak is] adept at blocking incoming attacks with an alchemically sharpened Sith Sword." "The prized weapon of ancient Sith Lords, the Sith war sword is an incredibly sharp blade treated with ancient Sith alchemy to produce a deadly weapon." Darth Malak temporarily incapacitated Revan in a Force Whirlwind with a mere gesture. Darth Malak, while his powers were amplified by the Star Forge, choked two Jedi Knights simultaneously, and even walked away for a duration of time as he talked to Revan with them still in his powerful grip. "As you are about to enter the construction pits, two Jedi are forcefully flung out of the door, and wracked with lightning." Malak hurled Demagol hundreds of feet across the Senate Building. Darth Malak's telekinesis simultaneously prevented Revan from passing through two different doors. "This door is held closed by some great power." Darth Malak casually threw Carth Onasi onto the floor, then mocked him. Darth Malak, while his powers were amplified by the Star Forge, utilized a lightsaber throw to kill a Jedi. Darth Malak was stated to be masterful in Force Whirlwind. "[Darth Malak can] call upon the Force to surround an enemy in a swirling vortex of Force energy. The whirlwind lifts them about a half a meter off of the ground, spinning them in the air and buffeting them with Force energy." Darth Malak was stated to be masterful in Force Slam. "[Darth Malak can] pound one or more creatures with the Force." Darth Malak was stated to be proficient in Force Wound. "[Darth Malak can] cause spasms in the lungs of [his] target, painfully injuring them." Darth Malak was stated to be proficient in Force Scream. "[Darth Malak can] create an intense sonic scream, amplified by the Force." Darth Malak was stated to be proficient in Force Choke. "[Darth Malak can] use the Force to choke or crush [his] enemy." The content in the next section reflects the power(s) of Stasis Field also known as Force Stun. Darth Malak temporarily incapacitated Revan in Force Stasis with a mere gesture for over twenty seconds. He was able to maintain the field even after withstanding a lightsaber blow from Bastila Shan. Only once he fully engaged in combat with Bastila Shan was Revan able to free himself and escape. Darth Malak temporarily incapacitated both Bastila Shan and Carth Onasi instantly. "Malak's incredible power incapacitates both Carth and Bastila..."
Darth Malak was stated to be masterful in Force Stun. "[Darth Malak can] call upon the Force to overload an enemy's senses, potentially stunning them." The content in the next section reflects the umbrella title of Force Corruption, also known as Telepathy, Force Fear, Mind Trick, Mind Control, Force Persuasion, Affect Mind, and Alter Mind. Darth Malak was so powerful his mere thoughts cause disturbances in the Force throughout the galaxy, and his dark side presence can be felt slowly approaching from thousands of star systems away. Darth Malak was so powerful that his mere presence can overwhelm powerful Jedi to the dark side. Darth Malak and Revan left behind traces of their dark power wherever they walked. "[Darth Revan and Darth Malak] were strong enough in the Force to leave a trace"
"Revan and Malak were here before us - I feel their dark presence." Darth Malak was stated to be proficient in Dominate Mind. "Dominate Mind enables persuasive use of the Force, and very few beings can resist its effects." Darth Malak, while his powers were amplified by the Star Forge, killed a Jedi or two with Force Lightning instantly. He did this with such speed that Revan didn't even appear to move to stop him. Darth Malak tortured Bastila Shan with Force Lightning, making her scream in pain. Darth Malak was stated to be proficient in Force Lightning. "[Darth Malak can] blast an enemy with deadly arcs of Force energy." Darth Malak, while his powers were amplified by the Star Forge, used the Force to siphon the life energy of his captive Jedi Knights. It was so deadly it charred the Jedi into lifeless, hardly recognizable husks. "The Sith Lord had grotesquely adapted the Rakatan device to draw energy directly from chained Jedi captives. He replenished his life force from the captives by draining theirs." "The Star Forge is more than just a space station. In some ways, it is like a living creature. It hungers. And it can feed on the dark side that is within all of us! Look around you, Revan. See the bodies? You should recognize them from the Academy. These are Jedi who fell when I attacked Dantooine. For all intents and purposes dead, except for one difference:I have not let them become one with the Force. Instead I have brought them here. The Star Forge corrupts what remains of their power and transfers the dark taint to me! You cannot beat me, Revan. Not here on the Star Forge. Not when I can draw upon the power of all these Jedi! And once you are beaten I will do the same to you. You will be trapped in a terrible existence between life and death, your power feeding me as I conquer the galaxy!" "The Jedi hangs in the grasp of the electrical prison, charred and drained of his lifeforce." Darth Malak was stated to be proficient in Force Drain. It is also stated in the sourcebook that he can amplify his Force Drain's powers to be effective as far as a Star System's distance. "[Darth Malak can] draw life energy from living beings, gradually absorbing it [himself]." The content in the next section reflects the power(s) of Sith Sorcery, also known as Sith Magic or Rituals. Darth Malak had a great wealth of knowledge from Malachor V and Korriban. "Led by a woman named Kreia, the rogue Jedi turned to the dark side teachings uncovered by Malak and Revan. Kreia took the name Darth Traya, and her followers called themselves the Sith after the long-lost species that had invaded the Republic a millennium before." "Two Jedi acquired a taste for rebellion during their victories in the Mandalorian Wars. They discovered pre-Republic Rakata artifacts that led them to the Sith tomeworld of Korriban. Despite their lack of connection to the Sith species, they drew knowledge from the Sith tombs and declared themselves to be the new Dark Lords of the Sith - Darth Revan and Darth Malak." Darth Malak may have increased his physical resistance with the Force, allowing him to withstand more injuries without faltering. It is possible, however, that he was merely making use of his armor. "Malak ignores the [the first effects] of any kind of damage. Whether this is due to hidden armor linked to his voice mask or the physical result of Sith alchemy is anyone's guess." Darth Malak was stated to be proficient in Sith Sorcery, being capable of calling upon the spirits of ancient Sith Lords for additional power on top of his own considerable Force abilities. "[Darth Malak can] channel the spirits of deceased Sith lords, using their power to supplement [his own]." Darth Malak was stated to be proficient in Sith Alchemy, being capable of altering the composition of living beings, creating dark side abominations, and reshaping and strengthen inanimate matter. "[Darth Malak is] trained in the dark side's alchemical arts. [Darth Malak can] use ancient Sith equipment, along with arcane formula, to alter the molecular composition of living beings, creating mutants steeped in the dark side-and bound to your will. [Darth Malak] can also reshape inanimate matter, making it sharper or stronger, as the ancient Sith frequently did with their weapons and armor." Darth Malak used Force Rage to become more powerful during combat. "Darth Malak is a straightforward lightsaber combatant. True to his character, his abilities and powers focus on attacking his enemies head on. His [strong defense and offense] enables him take on strong opponents, and he can increase his damage through Sith Rage when desired." Darth Malak was stated to be proficient in Dark Rage. Darth Malak was stated to be proficient in Force Affliction. "Affliction causes a target to suffer as though poisoned." Darth Malak was stated to be proficient in Force Slow. "[Darth Malak can] slow [his] targets as if they are encumbered by an extremely heavy load, making it difficult for them to move." The content in the next section reflects the power(s) of Force Suppression also known as Force Breach. Darth Malak was stated to be proficient in Force Suppression. "You can convince others that they have been cut off from the Force, even if that is not the case..."
The content in the next section reflects the power(s) of Force Concealment, also known as Force Cloak, Force Stealth, Buried Presence,Force Camouflage, Force Fade, or Force Haze. Darth Malak and the growing threat of the dark side was powerful enough to shield a disturbance in the Force - the mass death of dozens of Jedi - from the senses of even Revan and Bastila Shan. "We should have felt a disturbance in the Force when the attack came. The fact that we did not is a bad sign. I fear the dark side is growing stronger, casting shadows our vision cannot piece." Darth Malak was stated to be proficient in Dark Healing. Darth Malak was stated to be proficient in Energy Resistance. "[Darth Malak can] use the Force to protect [himself] from damage caused by energy, sonic, fire, cold, and electrical sources." Malak was able to locate the secret entrance to First Spear before Revancould.The planet they were on, Rekkiad, is renowned for its incredibly intense and freezing climate. This is also a display of Force Sight. "Revan shivered in the cold. Beside him, Malak said something, but the fierce wind whipping across the plateau devoured his words. “Are you sure it’s here?” Malak called back. Revan glanced over at the other peak rising up beside them, barely visible through the swirling snow. It was nearly identical to the one they were on—a tall, narrow column of wind-carved ice and snow rising up several kilometers from Rekkiad’s surface, its peak worn to a smooth, flat plain of ice. The two figures moved slowly back and forth across the exposed plateau, searching with the Force as much as with their eyes. "Here!" Malak shouted. "I found it!" Malak and the other Jedi Crusaders sensed a disturbance in the Force across the galaxy. Malak's senses were very keen, especially against Mandalorians. "Weird, seeing him again, especially since seeing any Mandalorian sets my senses on edge." Darth Malak was stated to be masterful in Force Sense. Malak and the other Jedi Crusaders have a vision on the Massacre of Cathar. Malak and the other Jedi Crusaders have visions about Arkoh Adasca. "I wouldn't have come at all, but some of us had visions that what you've discovered may be important." The content in the next section reflects the umbrella title of Pain Resistance, including Control Pain, Endurance, Stamina, Pain Tolerance, and Durability.This may also be a display of Force Healing. Malak was able to withstand extreme amounts of pain and torture. Demagol performed some of the most wicket experiments on him such as mutating and disfiguring his facial and spinal structures... and vivisections. Malak, nevertheless, even volunteered for this torture at times and came out of it joking. "Entry #6066: Squint. I retract what I said about human Jedi. What a marvel this “Squint” is! Irradiation. Electroshock. Even stress tests on the rack. All have been done, and yet his Jedi powers block out the pain. What a skill to be born with. If only my project had ended more happily — what a force we could have been! I’ve spared him the most invasive procedures. It seems a shame to kill him; he ranks more highly on the Wyrick Index than any of the others. And yet he endures all, wearing a look of sheer hate even I can recognize. I doubt cyborgs can clench their jaws as hard. He was born hating Mandalorians, I can tell. Spawn of some world the Republic cared little for, now trying to force them to care. He welcomes war with us; he will start one, if he must. I cannot break him. He could leave today with little more than an elongated spine. Which is why this must end in vivisection. I should not want to meet this one in a darkened alley." "No worries, guys. I'm a bit taller, that's all..."
"Nothing I can't handle. There are better vacation spots in the galaxy, though." Darth Malak's pain threshold was so great he survived his entire jaw being sliced off. "Malak loses his lower jaw to Revan's blade, necessitating a metallic jaw guard." Malak survived a hit from Mandalore's extremely deadly battle-axe with only being a little dazed and knocked on the ground. He was soon back on his feet and battling hordes of droids and Mandalorians. Forged in the shape of a traditional mythosaur axe with metals taken from the Galactic Republic's prized Courageous, the weapon had long pole staff and the addition of cortosis, as well as an energy cell. It was twice as deadly as the one Mandalore the Indomitable wielded when he confronted Ulic Qel-Droma. Darth Malak was able to withstand a lightsaber throw off of him with only a grunt. Malak recovered from a punch to the face from Demagol, then went on to defeat him. The content in the next section reflects the power(s) of Mental Resistance, also known as Telepathic Resistance, Force Resistance, Willpower, Mental Fortitude, and Psychological Resilience. Darth Malak was capable of calling upon the power of the Star Forge to create anything his will desired, without being devoured by its power, something no individual in the entire Sith Order or Rakata civilization besides Revan himself could do. He even had greater command over the Star Forge than even his former master, pushing its production to 300% its expected amount. The corruption of the Star Forge is so great that it is attributed to the end of the Rakata Infinite Empire, and the mere Star Maps were capable of causing the downfall of Ajunta Paul's Sith Order and the mass corruption of Kashyyk and Tatooine wildlife. Since he resisted its immense draining energies, whereas all other Dark Jedi were consumed, this is also a display of Force Barrier, also known as Force Protection Bubble, Force Aura, and Force Shield. "There is no one left with the power to control the Forge, though many have tried. I have watched them be devoured, their life drained from them as they attempt to tap into its power. Knowing what we do of the Builders and their fate, I'm convinced that Revan did not intend us to keep the Star Forge - to use it would mean the end of the Sith... the end of the Force." "In your terminology, the Star Forge is a tool of the dark side. It corrupts those who use it so that it can generate greater and greater amounts of negative energy to fuel itself. The Builders thought they were strong enough to control this effect, but they were wrong. They became victims of their own creation, and eventually their hatred turned them against each other. Civil war destroyed the Infinite Empire - a lesson to remember. Only one who is immensely strong in mind can harness the power of the Star Forge without suffering a similar fate." "The Star Forge was an enormous space-station/factory that harnessed the power of an entire star. Within its hull was a vast, intricate network of automated machines designed to mass-produce weaponry, droids, and starships. However, it was more than merely a metal construct. Its shadowed cavities were infused with the dark side of Force, endowing it with evil, breathing life." Darth Malak walked on the surface of Malachor V, and even within the halls of the Trayus Academy itself, without being corrupted. Thousands of Jedi and Kreia herself would later fall victim to this corrupted planet. "There is a place in the galaxy where the dark side of the Force runs strong. It is something of the Sith, but it was fueled by war. It corrupts all that walks on its surface—drowns them in the power of the dark side. It corrupts all life, and it feeds on death." Malak resisted the effects of Nathema, which creates a sensation of discorporating even powerful Jedi into trillions of subatomic particles that would scatter across the entire surface of Nathema, for a long time. "He knew with absolute certainty that he had been to this world before. He remembered its deserted city and its lifeless surface. He remembered searching the empty buildings with Malak, looking for archives, records, and astrogation charts that would guide them on the next step of the journey. But most of all, he remembered the horror of a dead planet entirely stripped of the Force." "Her body reacted with a revulsion so strong she felt physically ill. Her mind briefly tried to imagine what had happened to cause such an abomination, then recoiled from the answers. Her mind went blank and her body numb. She stood motionless for several minutes, or maybe it was several hours; time had no meaning here. But the incessant squawking of T3 eventually roused her from her stupor. ...The entire process took less than five minutes, but for Meetra it might as well have been an eternity. She had managed to keep busy up until this point, but while waiting idly by for T3 to finish she began to notice the absence of the Force once more. She could feel the Void pressing in on her from all sides. At the same time it was pulling on her, trying to rip away the very essence of her existence. Nature abhors a vacuum; the emptiness was trying to fill itself with her energy. For an instant she felt as if she were going to become undone, her physical body discorporating into trillions of subatomic particles that would scatter across the entire surface of Nathema. No! she screamed in her mind. The Void will not take me! I am more than just a collection of random matter and particles! I am a living being. I am Meetra Surik! The affirmation of her own existence seemed to push the Void back, at least for the moment. But Meetra knew she couldn’t hold out against it much longer. As much as she tried to ignore what she felt—or, more precisely, didn’t feel—all around her, she knew it was only a matter of time until the horrors of Nathema stripped away her sanity." Darth Malak was stated to be proficient in Force Resistance. Darth Malak was rumored to be far more powerful than Exar Kun or Freedon Nadd thanks to cybernetics. Darth Malak was "the brawn" to Revan's "brain", suggesting physical superiority. "For me, Malak was always the 'brawn' to Revan's 'brain'..."
Malak manhandled Demagol, throwing him onto the ground and choking him. Malak needed both Ferroh and Telettoh to restrain him. Darth Malak was a two meter giant with an enormous, physically muscular build. Darth Malak was stated to be as physically strong as possible. "Darth Malak was not always a model Dark Lord. He was once a compassionate Jedi Knight. In fact, Republic citizens' sufferings so move the young Jedi Alex Squinquargesimus during the Mandalorian Wars that he rebels-along with his good friend Revan-against the Jedi Council's decree of inaction. The young Jedi helps recruit thousands of Jedi to spearhead the war against he Mandalorians, and they drive back the invaders. Yet sweeping victories correspond all too frequently with proportionately devastating moral compromises. Day by day, Alex perceives himself sliding toward the dark side, but sees no alternative. The horrors of war are not a mystery, and he knew he would face this dilemma. Just as he intends, Alek saves the galaxy. Victorious against the Mandalorians, he realizes that all his efforts may be for naught if a strong hand does not steer the galaxy. In actuality, besides himself, he knows he can trust only the soldiers he had fought alongside, because they are capable defenders. Sharing these thoughts with Revan, Alek finds his brother-in-arms agrees. Now Alex understands the dark side. It is named from ignorance: the ignorance of never having killed, or never having ordered friends to their deaths, of always thinking today is your day to die-all for wards, unwilling to fight for their own safety-and ignorance of what it means to wield so much power. Revan, or course, understands completely. After the Mandalorian Wars, Alek and Revan subsume themselves in Korriban and Malachor V's Sith occultism and use the Star Forge super weapon to churn out war material almost limitless. Alek then becomes Darth Malak of the remade Sith Empire, apprentice to Darth Revan. The Republic conquest initially goes well, but in time, Malak ses Lord Revan as soft, resulting in a tension that culminates in a lightsaber duel; Malak loses his lower jaw to Revan's blade, necessitating a metallic jaw guard. Returning the favor, Malak fires on Revan's flagship. Unaware that the Jedi have captured the traitor, Malak assumes the crown of ruling Dark Lord, inheriting the empire. With Admiral Saul Karath, Malak's fleet spreads terror and he cultivates Darth Bandon and Bastila Shan as his pupils. However, Malak faces Revan again, this time as a reconditioned Jedi. In the rematch, Malak's twisted dream of protecting the galaxy dies with him." "Darth Malak: Four thousand years before the creation of the Empire, the Republic faced many enemies and endured many wars. When the Mandalorians attacked the Republic, the Jedi were split -- join the fighting or stay out of it? Ultimately, two Jedi ignored the will of the Jedi Council and plunged into battle. Revan and Malak led the Republic forces; the former provided clever tactics, and the latter was relentless and reckless in combat. The two pursued their enemies into the Unknown Regions. They returned as Sith Lords backed by a huge military force from an unknown source. Darth Malak started as an apprentice but soon became the master. With the Sith forces at his command, he tore through the Republic, razing entire planets. His success was short lived, however, and he fell to an unexpected enemy." Four millennia before the man called Palpatine became Emperor, Malak shone brightly as one of the greatest Jedi heroes. With his comrade Revan, he defeated the Mandalorians in a fierce war that rocked the Republic to its core. But the final victorious battle against the Mandalorians on the Galactic Rim changed the two Jedi. They both gave themselves to the Dark Side, and the newly rechristened Darth Revan and Darth Malak returned from the Outer Rim with a space fleet bent on conquering the galaxy. Though Revan was the master to Malak's apprentice, the senior Sith Lord soon fell to treachery. Enraged by the death of his master, Darth Malak declared himself the Dark Lord of the Sith and renewed his campaign of hatred and bloodshed. At his disposal was a thousands-strong army of trained Sith conscripts and corrupted Dark Jedi, and a rumored alliance with the massive Czerka Corporation. Malak's Sith fleets were comprised of Republic defectors and a seemingly limitless supply of strange, alien battleships. An imposing figure with ghostly pale features, prominent Sith tattoos, a gleaming red lightsaber, and devastating Dark Side power, Malak struck terror into the hearts of his former allies. He also wore a vocal mask that may have concealed a form of cybernetic life-support. Did it provide him with powers far greater than even Exar Kun or Freedon Nadd, or was cybernetic enhancement too simple an explanation? Darth Malak makes an excellent villain for a higher-level campaign set during the Golden Age of the Republic. And if the heroes expect to find him, they'll need to fight their way through the Sith. Once they reach Malak, he may face them with his own lightsaber or, if he feels the occasion calls for it, an ancient Sith sword recovered from ruins on Korriban." Iike this a lot already. Good work. Make a Reven one!!!! Or Meetra. He has already made a Revan one, and I have already made a Meetra one. @darthant66: Yeah, it was a Whirlwind. "Bastila could be thought of as a second-tier Jedi. She's clearly not as capable as characters such as Mace Windu, Jedi Master; Yoda, Jedi Master; or Darth Vader, Jedi Hunter; but she's roughly on par with Obi-Wan Kenobi, Jedi Master or Darth Tyranus." @shootingnova: What is the accolade that Ti is on Mace's level? @shootingnova: I doubt it's true. Shaak Ti is one of the weakest known Jedi in the Rise of the Empire era. I have to say I disagree with Karpyshyn in his "feeling Malak is more skilled than Revan". I can't say I'm an author, I just find this idea to be baseless and mostly on his own personal, subjective thoughts, as with all of us. It's part of why his quotes outside of actual sources aren't canon, and he tends to preface them with "it's just my [unofficial] opinion", etc. I can't say it's implausible, I just find it to be relatively baseless with exception to possibly being based on unexplainable instincts. Really, nothing indicates Malak was more skilled than Revan. Revan defeated Mandalore, who, in turn, stomped Alek without circumstantial aid. Alek just charged him and got one-shotted, to memory. I do not believe Malak would have improved over his former self anymore than Revan would have improved over his former self, so I really have no idea what the urge is to claim Malak is more skilful for. What implies his combat and lightsaber skills are superior to Revan's? The latter has a host of accolades, whereas most of Malak's aren't even impressive (I still can't find the quote for being one of the best swordsmen, so I really would just assume it doesn't exist for now), and Revan has the better skill feats. He's just the better swordsman. Despite skill tending to matter more than Force abilities most of the time, including with characters such as Revan and Malak, Malak needed to be significantly amped to fight Revan and still lost. That in of itself might imply Revan is more skilful. He definitely is more powerful, but if Malak was more skilled, then Malak should have been the one to win. Skill is more pertinent than Force ability more often than not, and this does apply to the type of fighters the two are. That, and Malak was amped in terms of his Force power to begin with, so the disparity in Force power should have been lessened, which again, increases the likelihood of skill being the determining factor. Based on that, I just find Karpyshyn's quote to be unfounded. 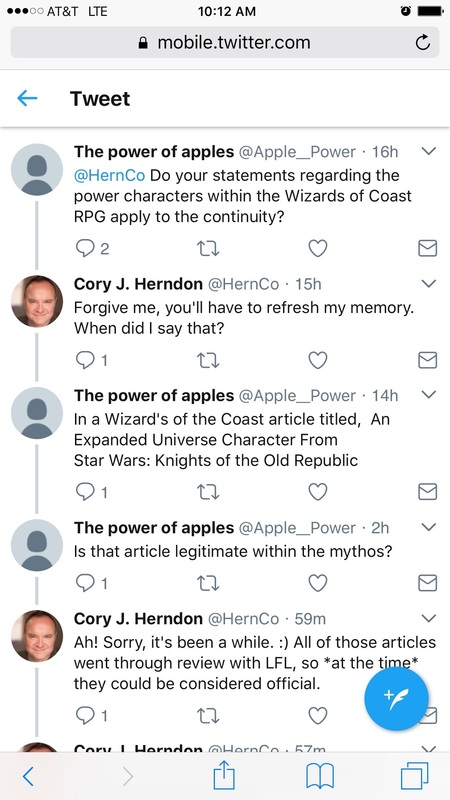 While I do appreciate the work here, I'm not sure I would list those masters as powerful. As I recall, they were pretty much "fodder masters". @silentbat: No, it isn't. Master is a title, not a rank of power. @darthant66: Very good, but two questions. 1) Why would you think Juyo is his style? Not Form 2 which would explain the one hand dueling and ability to out spar other Jedi, even Revan. Its the same pattern as Dooku. 2) Squint was Malak? How did he survive? 1.) Drew Karpyshyn said in an email once that he used Juyo. 2.) Yes. He joined up with the Jedi Crusaders - Revan's movement.